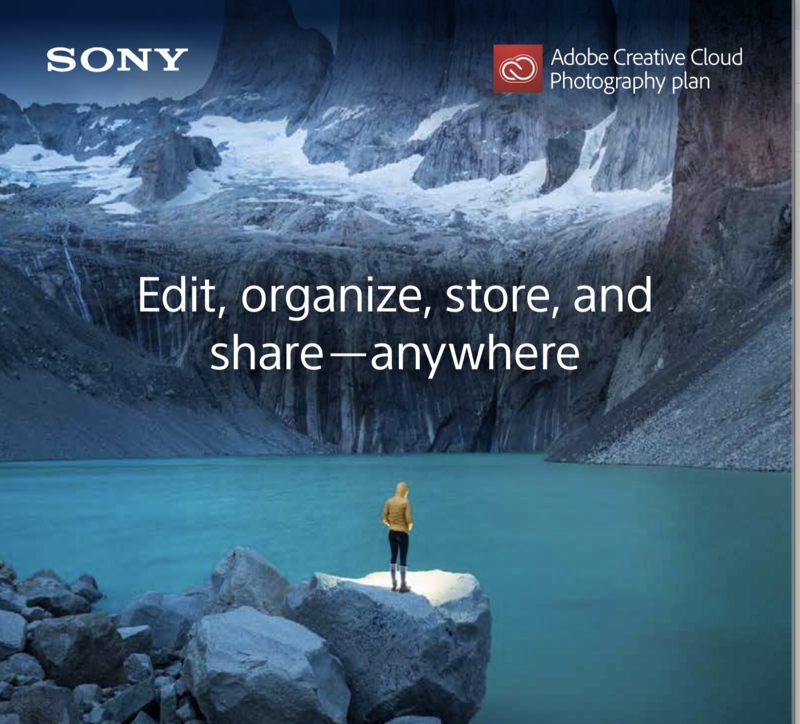 Get 3 Months Of Adobe Creative Cloud Photography Plan + Storage Up to $59.97 Value, See Details. Offer ends: April 11th, 2019. Review rebate instructions here. The α6300’s unrivaled 4D FOCUS™ system boasts the fast autofocus (AF) acquisition time1 that can lock focus on a subject in as little as 0.05 seconds. It also an incredible 425 - phase detection AF points2 that are densely positioned over the entire image area, and can shoot images at up to 11 frames per second with continuous autofocus and exposure tracking. Additionally, the α6300 takes full advantage of its enhanced fast hybrid AF for movies in both HD and 4K. Other enhancements include silent shooting with continuous autofocus and auto exposure, the ability to use AF in focus magnifier mode, expanded flexible spot AF, Eye AF in AF-C mode and more. The newly developed 24.2 MP (approx. effective) APS-C Exmor® CMOS sensor features copper wiring and enhanced circuit processing that lower the wiring layer and boost light collection efficiency. In conjunction with the BIONZ X® image processor, it minimizes noise throughout a wide sensitivity range of ISO 100-512005. The highly conductive copper in the circuitry significantly accelerates readout speed to support 4K movie recording with full pixel readout without pixel binning, Full HD 120fps shooting and 14-bit RAW output for still images. The α6300 offers internal 4K recording4 in Super 35mm format with full pixel readout, no pixel binning and 2.4x oversampling for the ultimate movie quality. By collecting 20 megapixels (6K equivalent) of information, which is approximately 2.4x as many pixels as 4K, the α6300 then oversamples the information to produce high quality 4K footage with exceptional detail and depth. Additional professional video features include; S-Gamut3/S-Log3 and Gamma Display Assist, the ability to record Full HD at 120 fps for 4x or 5x slow motion HD video, both a mic jack and XLR compatibility via the MI shoe, enhanced Zebra functionality, picture profile settings, as well as Time Code / User Bit, clean HDMI output and much more. The α6300 is equipped with a high contrast, high-resolution XGA OLED Tru-Finder with approximately 2.4 million dots that offers exceptional corner-to-corner visibility. There is also a new mode available for the viewfinder that allows display of images at 120Hz, ensuring that action is displayed smoothly with very few afterimages for the sense of immediacy you get when shooting with an optical viewfinder, making subject tracking through the Tru-finder easier than ever. The α6300 is equipped with an extremely solid magnesium alloy body that’s dust and moisture resistant for extreme conditions. The robust lens mount and refined grip makes it easier to shoot with larger heavier lenses, while the new 2.4-million dot XGA OLED Tru-Finder™ with selectable 60fps/120fps refresh rates allow for faster subject tracking. The α6300 can be customized to fit nearly any shooting style or preferences with one of 65 different functions that can be assigned to one of the 10 customizable buttons. A new shutter release button and mode dial with improved operability add to the refined shooting experience. The α6300 offers focal plane phase-detection autofocus with A-mount lenses that have SSM (Super Sonic wave Motor) or SAM (Smooth Autofocus Motor) and by using a LA-E3 or LA-EA1 (APS C format with LA-EA1) lens mount adaptor. You can take advantage of the wide AF coverage of 425 focal plane phase-detection AF points, high-speed response, high tracking capability and high optical performance of A-mount lenses. The consumer friendly XAVC S™ format6 supports 4K recording at maximum 100Mbps bit rate as well as Full HD recording at 50Mbps, so the α6300 can capture movies6 filled with finely detailed movement. For efficient handling, XAVC S™ files are minimized in size using Long GOP data compression, and contained in the widely compatible MPEG-4 AVC/H.264 format. The tiltable 3” (921k dots) LCD™ Display makes it easy to photograph over crowds, or objects close to the ground or maybe you just want to get a different perspective. The screen can swivel up approx. 90° and down approx. 45°. The large display delivers brilliant-quality still images and movies thanks to WhiteMagic™ technology that nearly doubles the brightness of the display through a unique RGBW pixel structure for easier checking of the focus and image details. Release the shutter without a sound when silence is required, even when continuous shooting with autofocus and auto exposure tracking is engaged. For quicker access, assign Silent Shooting mode to a customizable button.